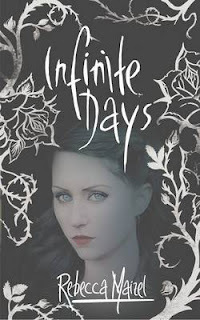 Infinite Days was definitely different to any other vampire book I have ever read. It certainly had a nice twist where it involved the magic but not so much that it became a magic book. I loved the way it evolved over a long period of time as I think so many authors try the keep the time slow but Maizel has just let go and let it flow. The story runs smoothly and everything slots together. The book is written very well and I loved Maizel’s style of writing so I cannot wait for the sequel: Stolen Nights. The story is basically about a girl who has been a vampire for five hundred years and wants to be human. She gets that wish but to become human another must sacrifice themselves for you. Anyway she goes to school meets the hot boy, falls in love and all the rest. Then her coven come looking for her, find her and make her into a vampire. Long story short. The book was unique though. The twist at the very end where Lenah sacrifices herself. Big surprise. If I had finished the book it would have gone something like this. All I felt were dazzling gold diamonds of light. I knew this was the end. Everything would be gone. But then someone pulled me. The grip was strong, firm and love coursed through it. Vicken. I flew back and landed on the table my head hitting it hard. That’s when the pain started. It rushed through my body as the side effects of the sun kicked in. I screamed a piercing scream and I saw Vicken wince as I did. I screamed again, this time louder. I was about to scream yet again but Vicken kissed me. I kissed back and only then did I realise I could feel his lips against mine. Taste the softness on his lips. I was human and the pain was gone. “When you sacrificed yourself I figured that if I said the ritual I would kill my vampire form, which was already dying, and not my human form and I guess it worked.” He said. He looked at me and his head dropped. “I’ll be going.” He said. “Wait!” I said and pulled him around. I kissed him firmly on the lips and stood back. Now my favourite character is Justin. He’s the perfect boy but with normal issues. I mean he grieves losing Lenah so much and basically mourns over her. He has a cool personality and has witty answers for everything so yeah. I am so glad I bought this book. One of the best ever and I just love it, so five stars from me! I loved this story! Best vampire book in the world and one of the best book's I've ever read.I was ready for another vampire romance series.